Congratulations to TopDrift round 2! winners! JUSTDRIFT | charlie@justdrift April 26, 2010 | Comments Off on Congratulations to TopDrift round 2! winners! TOPDRIFT THIS WEEKEND! April 24-25! We are going to have 3 run groups for Saturday and Sunday. Total registered driver is 35 and we’ll probably reach to 40 max by end of this week. Some drivers have already dropped out due to car issues that they can’t resolve by the weekend and will resume at ASB. We have ex pros that have registered to regain their pro license back by end of season and some just out to have fun with everyone. 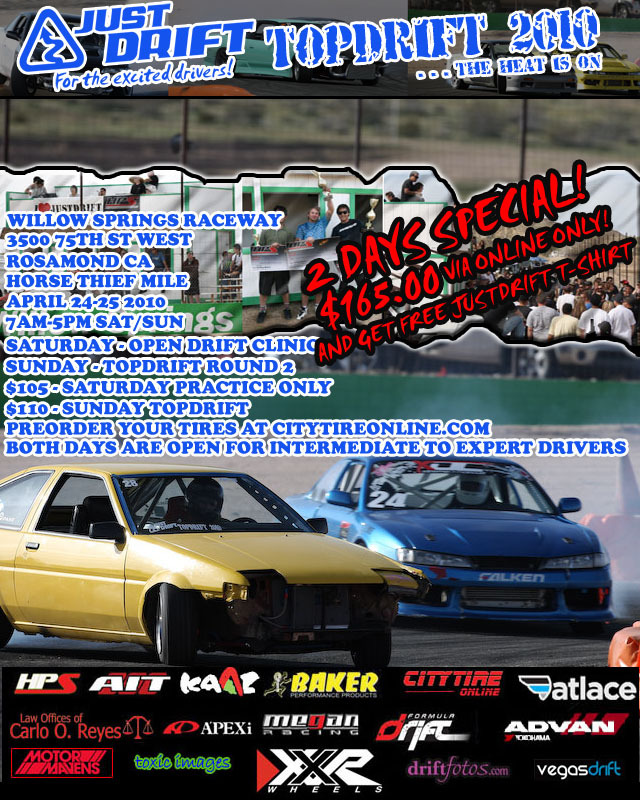 After round 2, we have a open drift clinic at Willow Springs Raceway for 2 months before ALL STAR BASH. Then restart round 3. We’ll have more ASB info after round 2 is over. A couple night drift events in the middle before ASB. Goodluck and see you this weekend at 7AM! I’d like to take this opportunity and share to everyone our generous sponsors and supporters of the event. We encourage you to support them back. These are the die hard fans of grass roots drifting and drifters alike. Thanks sponsors!!! Willow Springs Raceway, HPS, Yokohama/Advan, Megan Racing, AIT Racing, City Tire online, XXR wheels,FormulaD, KAAZ USA, APEXi, Hankook tires, VegasDrift, HellaFlush, Ziptied.com, MotorMavens, Toxic Images, SpeedHunter, DriftFotos.com, The Auto Parts Connection, Atty Carlo Reyes, Top line, The TOPDRIFT judges, Hiro Sumida, Henry Schelley, Justin Pawlak, Taka Aono and JUSTDRIFT staff. JUSTDRIFT | admin April 21, 2010 | Comments Off on TOPDRIFT THIS WEEKEND! April 24-25! VegasDrift this weekend! Come get some! VegasDrift this weekend!!! Come get some before “the heat is on”! JUSTDRIFT | charlie@justdrift April 13, 2010 | Comments Off on VegasDrift this weekend! Come get some!